Mixed trains were common once upon a time. Mixed trains combined passenger and freight traffic, and were very common once upon a time. I photographed many a mixed train that ran from Terrace to Kitimat BC. 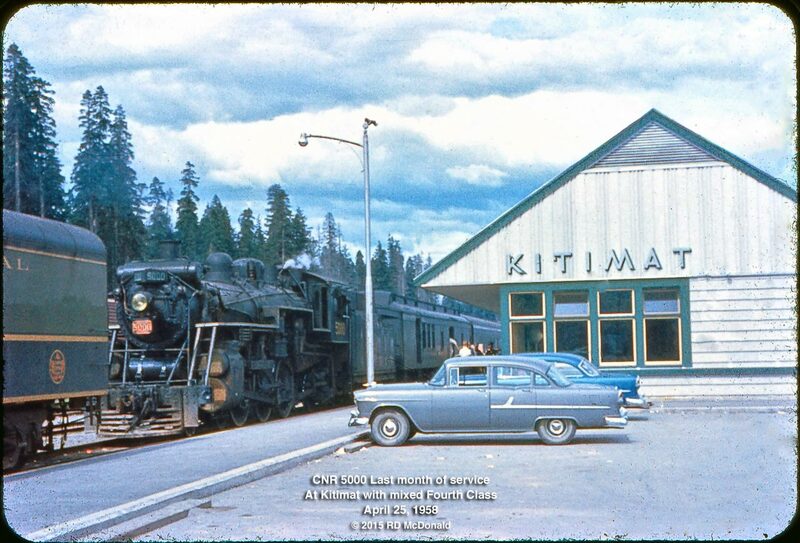 That train was especially busy during the week, carrying saw mill workers and logging camp personnel to active shows between Kitimat and Terrace. 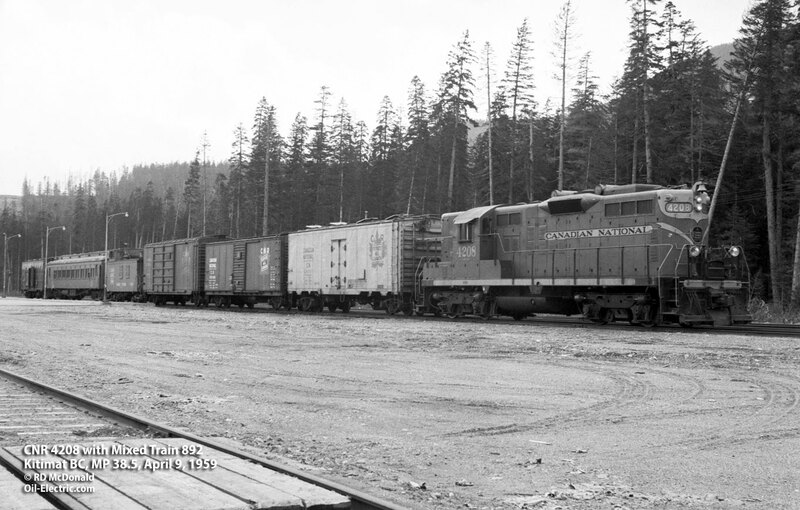 Here we see CNR 4208 pointing north toward Terrace BC in April 1959. Mail was being loaded from station camera left. A poster inside the station warned loggers that calked boots were NOT allowed in the passenger car. In the view above, CNR 5000 (4-6-2) in her final days before the cutter torch. Alcan felt the market need for increased aluminum plates and billets following the Second World War. Essential for a plethora of new products, from aluminum foil to aircraft manufacturing. 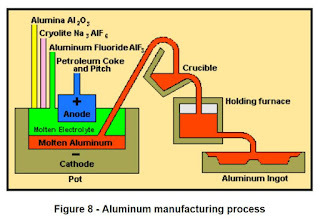 First requirement: The challenge for smelting bauxite (alumina) to a usable metal requires massive amounts of electrical energy. Alcan came up with an ingenious solution called the Kitimat Kemano Project, which harness a huge electric generation potential. Founded in 1902 as the Canadian unit of Alcoa. 1925 - Aluminum Company of Canada Limited formed. 1945 - Registers the name "Alcan." 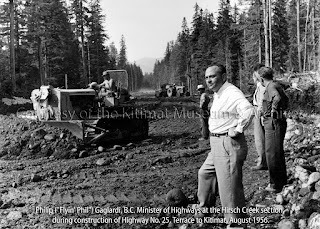 1952 - Begins construction Kitimat/Kemano Project. 1954 - Construction completed - smelter begins operation. 2008 - Rio Tinto (Au) assumes ownership. Second requirement: Deepwater access to the Pacific Ocean, for delivery of raw material — bauxite (alumina) — shipment of aluminum product. 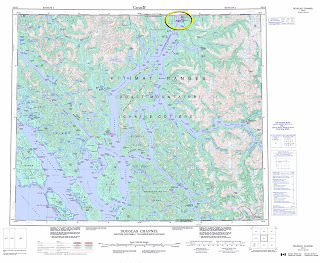 The Kitimat site sets at the end of a deep water fjord, Douglas Channel. 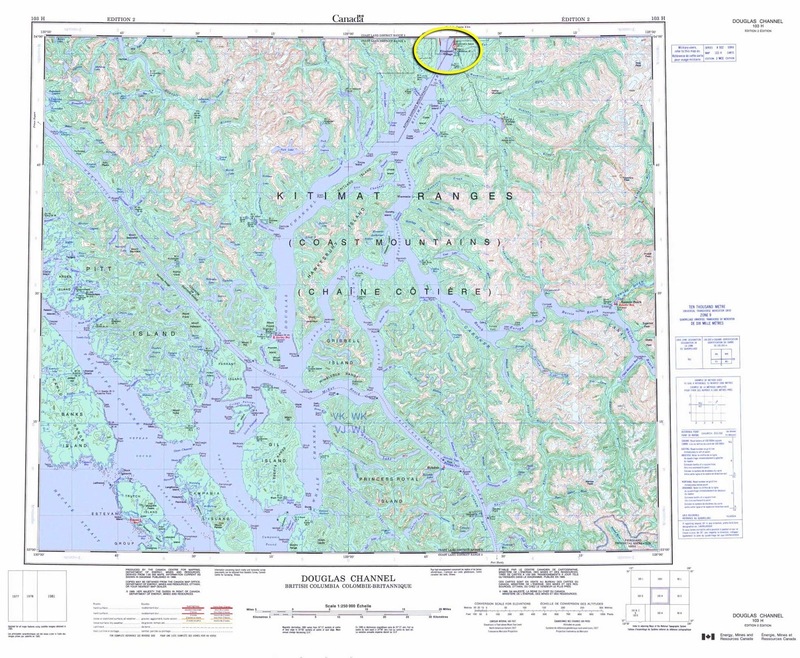 Alcan selected the Aboriginal fishing village site — and Morrison-Knudsen was contracted to build the dams, tunnels, power lines and smelter. A big deal! 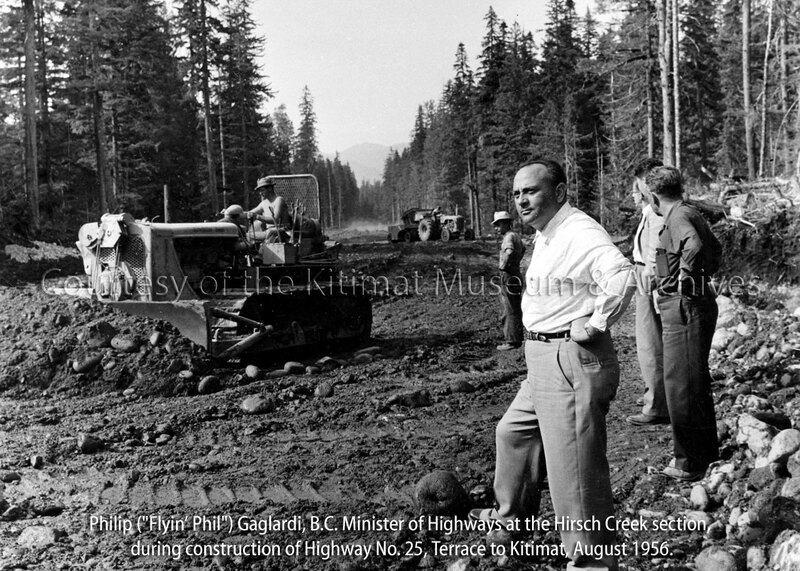 Highway Access: Until construction of the new smelter at Kitimat, little more than a wagon road joined the fishing village of Kitimat to Terrace. That all changed rapidly, when Highway 25 (now 37) was opened in November, 1957. 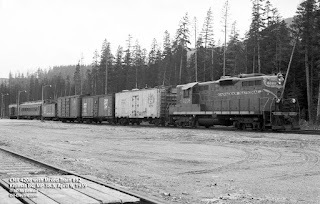 Railway Access: Canadian National Railways began a connector from the Skeena Sub main line at Terrace. The Kitimat Sub was constructed some 39 miles south from the main line to Kitimat, providing a rail connection to the newly constructed Alcan aluminum smelter. Construction of the 38 mile (61 km) line was completed on January 13, 1955. The Last Spike ceremony was held near Hirsch Creek. S.F. 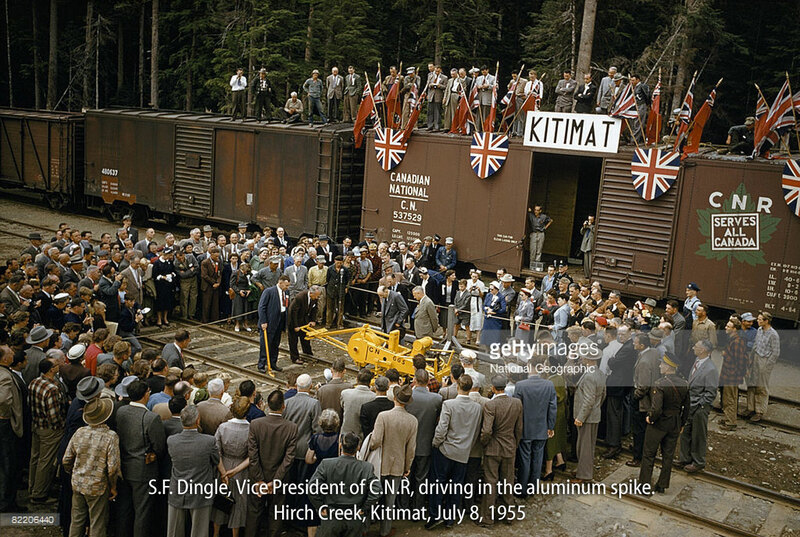 Dingle, Vice President of C.N.R, seen here driving in the aluminum spike. The line opened for business, with passengers receiving commemorative tickets made of sheet aluminum. That would be a collectors item, Yes? 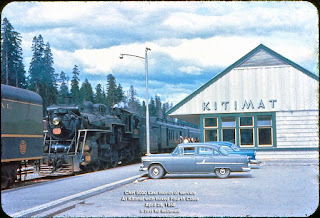 A couple of years ago, Scott in Prince Rupert forwarded photographs of the demise of the beautiful chateau-styled passenger station at Kitimat. There is a ambiance surrounding a mixed train in that there is a certain logic in the assemblage of cars. And on the Kitimat Subdivision, the pace was slow - 2.5 hours to travel 38.5 miles! Railroad Stuff: CNR 4208 GP-9, 1,750 hp. Originally erected as CNR 4590. Renumbered 1957. Built by General Motors Diesel Ltd, London, Ontario, 6/1957. Serial Number A-1242. 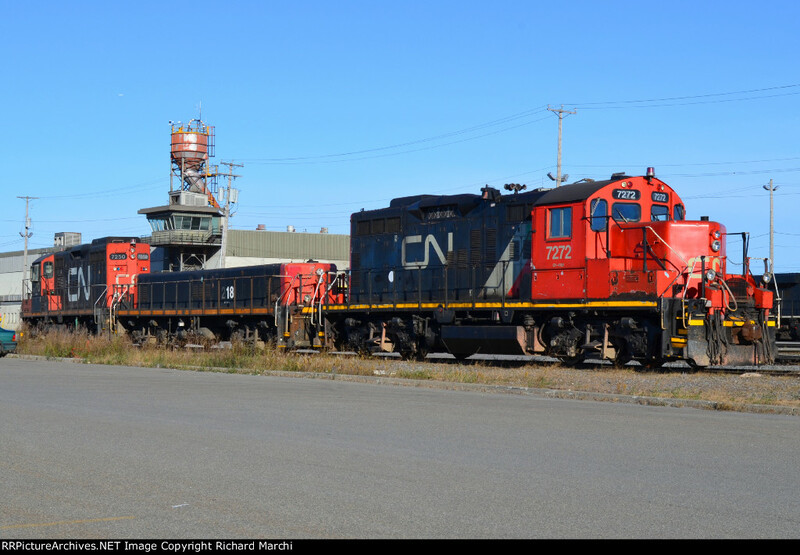 Rebuilt and renumbered CN 7272, GP-9RM. 1993.